Most car owners who modify their cars are aware that the modifications tend to decrease, not increase, the value of their vehicle when they want to sell it. Why is the vehicle worse less money after modification, when modification can cost a lot of money? Your tastes are unique and don't necessarily match the tastes of other drivers. But there are several even more important reasons to carefully consider any modification to the external appearance of your vehicle. People change the appearance of their vehicle to get a certain look, something perhaps sportier than the original version. Or, maybe they want to stay up to date in trends of color and wheels. But many car owners may not consider that their modifications can have safety implications, and may not even be legal. For example, you may have driven behind a vehicle that has darkened plastic covering their rear lights, usually on a dark colored or black vehicle. The appearance makes the car look more uniform in color, as the back lights are less pronounced. What you may also have noticed is the brake lights are not as bright on these vehicles. Owners of these vehicles risk being rear-ended due to their brake lights not being bright enough, resulting in the driver behind them not being aware that the car in front is braking. Some modifications, like tinting light covers, especially brake light covers, can be illegal. There are millions and millions of vehicles on California roads, so what are the chances a driver of a vehicle with illegal brake light modifications will get pulled over? Maybe slim. But the chance that they'll get in a car accident certainly rises, posing a public safety hazard. This is why this particular modification tends to be against DMV standards. Also, if the vehicle has modifications that contributed to the crash, even a rear-end accident that results in injury, liability will almost always go against the car that has the modification. Thus, if you modify your car and are injured, the chances that you're placed at fault are high. Then, in many cases neither the other party's auto insurance, nor your own, will pay for your medical expenses. Also consider that seemingly minor modifications, if enough to convince a police officer or California Highway Patrol officer that your vehicle's appearance had something to do with causing the crash, you may be liable for any injuries caused to other parties. A car modification to make your vehicle look "cool" may not feel so cool, after all. 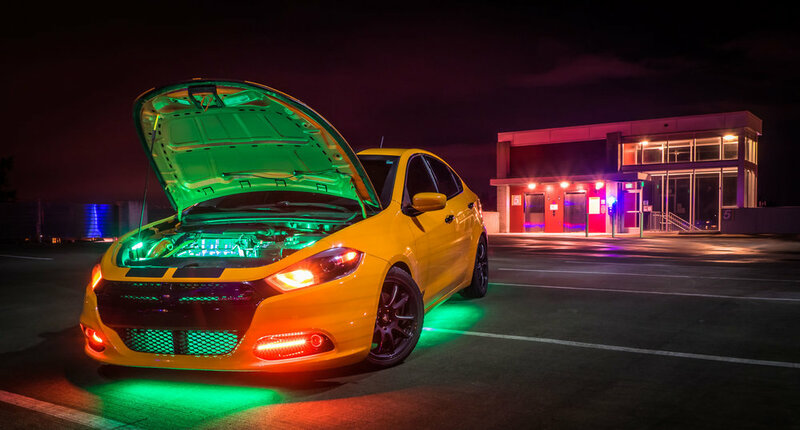 Some car owners have followed trends shown in the "Fast and Furious" movies, and other car racing movies, and install neon lights under their vehicle. Again, these modifications tend to be illegal, and the owner can be tickets. If the owner is ticketed on multiple occasions, the car may be impounded and their license suspended. What's the big deal of a little neon light? First, if you have neon lights under your car, the vehicle is very visable - too visable to other drivers, in fact, making it a distraction and a safety hazard. If you cause an accident and the other party says they were distracted by your lights, you're unlikely to convince the California Highway Patrol that your under-carriage lights had nothing to do with the crash. In fact, many California injury attorneys will attest that in almost every case where one of the vehicles has significant modifications, that vehicle is placed at fault on the police report. Stereotypes are often unfair and inaccurate, but they still matter. You may have an impeccable driving record and be an upstanding citizen in every way, and a great driver, but if you're involved in a crash that injures someone, the appearance of your vehicle matters. It may not seem fair, but California injury lawyers almost unanimously agree that the appearance of your vehicle comes into play when deciding who should pay for the damages. An extreme example may be helpful: if you're driving a sports car with bright paint, modified wheels, and other changes to the vehicle, and you're involved in a crash with a brown minivan, and the driver of the minivan says you were speeding and driving crazy, who do you think the police officer is going to believe? And modifications sometimes aren't needed at all: a sports car involved in an accident with a more "normal" car will often result in the sports car driver being put at fault. If your tint is too dark, you can expect raised suspicion by the officer who makes the car crash report. If you have after-market wheels on your car, that will also likely go against you. This is not fair, of course, as the kind of rims on your vehicle likely had nothing to do with causing the crash, but these statements are made based on many years of observation by experienced California car accident lawyers who have dealt with thousands of injury cases. Under-carriage lighting, especially neon, is a big no-no; if you want to do this to your car, it is recommended that you don't drive with the lights on. You're asking for a ticket, at a minimum, and if you're involved in a car crash and someone gets hurt, your chances of not being put at fault are very low. Don't tint your tail lights; it's most often against DMV code, and it often results in rear-end accidents. Flashing lights on the interior that can be seen from outside are a big no-no. Basically anything that could distract other drivers and are not necessary to the safe operation of your vehicle are frowned upon by law enforcement, and do in fact contribute to car crashes. Mirror paint, or metallic paint jobs can often be distracting (this is, of course, obvious and on purpose), and the drivers of these vehicles will often attest that the number of tickets and perceived harassment by law enforcement is simply not worth it. Not to mention, most of these chances to your car are expensive, some costing many thousands of dollars! What if You're Involved in an Crash That Results in Injury? If you were injured in a car crash, there are a lot of things to consider right away: your health, your auto insurance, the other driver's auto insurance, a police report or California Highway Patrol report, medical bills, lost wages - the list goes on and on. Most people have a decent idea of where to start and how to go about it, but there are endless loopholes designed to keep money with the insurance companies and out of your pocket. A call with an experienced car crash lawyer who practices in California may be beneficial. Also, if you were driving a modified vehicle and were involved in a crash where someone was injured, you may benefit from speaking with an attorney, especially if you feel you were unfairly put at fault. Speaking with an injury law firm may save you a lot of time, headache, and money in the long run, and most lawyers offer these consultations at no up front cost. The Lions Injury Lawyers practice injury law, and have seen many of the examples contained in this blog post play out in real life cases. If you or someone you love was involved in an accident that resulted in injury, you owe it to yourself to discuss the matter with an attorney, if only to reassure yourself you're going about things properly. The Lions Injury Lawyers represent clients throughout California, from San Diego all the way past San Francisco and including the Inland Empire and more remote parts of California.